While Man With a Plan has yet to entertain me as much as it did in its season two premiere, it's still remained thoroughly enjoyable and has yet to disappoint this season. Let's hope they can keep that up this week, when it focuses on Kate's boyfriend. Kate and her boyfriend Tyler are being super annoying when Adam storms in to tell Andi that he's a pothead. Adam says that Tyler needs to go, because potty it bad news. His dad instilled it in him and Don that pot is terrible, sometihing Adam has always believed. Andi doesn't see it as a big deal, but Adam's adamant bout it. Andi wants to ask Kate if she's even done it, which they agree to do. Adam tries to be sly when he asks, but he isn't at all. Adam chases after Kate to get an answer, and Kate has no clue why. She says she hasn't, and she's never seen Tyler do it either. Adam insists that Kate breaks up with Tyler, but she won't give up without a fight. He says he'll ground her if she keeps seeing him, but she reminds him that she goes to school with Tyler, and Adam easily loses this argument. Adam gets annoyed with Andi for not backing him up, and so he asks the guys at work. Don says to just let it go, but considering how much Don is respected, this is unlikely. Andi tells Adam that she actually tried pot and liked it, and did it once a month. And weekends. And Wednesdays. And Tuesday nights. Adam gets annoyed and tries to get Joe to straighten Andi out. Joe's opinion on pot has changed though, and he's been indulging himself. Adam's not very happy about this, but Andi certainly is. To protest Joe's decision, he steals his bear candies. Which are actually pot. Joe and Beverly don't want to tell Adam that he ate pot, because he hasn't really been effected. However, he soon shows signs, and Don and Lowell make sure to be there for it. Then, Tyler shows. up at the door, for a talk with Adam. Tyler knows what the talk is about, and he confesses to smoking pot. However, he tells him that he quit it because he wanted to get orders right at the restaurant he works at, which Adam really appreciated. Adam starts to realize that something is up, and before Andi can tell him, Lowell lets it slip that Adam is high. Don and Lowell quickly run out. Adam actually kinda likes being high, but wonders why Andi and his parents never told him. They all give him excuses, and he tries to be angry but is just too high to seem it. Later that night, Kate comes in to talk to Adam about Tyler, and he apologizes to her for the way he acted. She accepts, and even gives him a hug. This was a really great episode. It was a lot of fun, with Adam's adventures with Mary Jane providing for a fun storyline and an outcome that I definitely didn't see coming at the beginning of the episode. 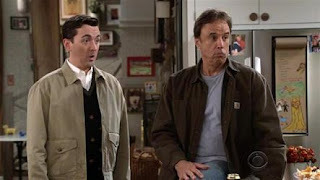 It's not exactly the most creative show, but Man With a Plan still manages to make me laugh out loud more than most other shows on TV. Lowell and Don were really great, and it was nice to see them get slightly larger roles. I also loved that Beverly returned for another episode, and she was quite funny (again) in what we got to see of her. I wish she was promoted alongside Joe, but at least we got one of Adam's funny parents as a main character this year. I'll take it! And like Andi, I will really miss 'Stoned Adam'. He was fun!